The Stadium Club at U.S. Cellular Field is an all-American pitch, matching baseball and apple pie and tenderloin with club level experiences. 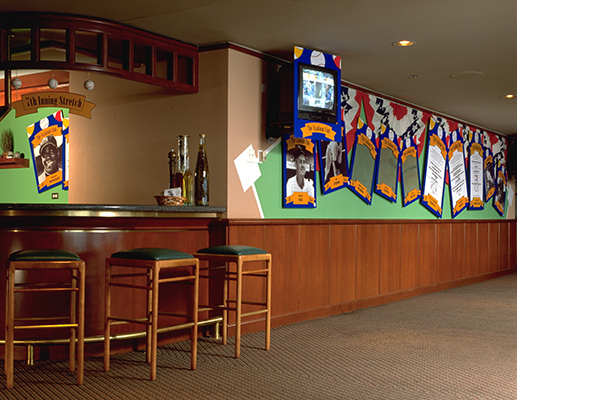 Set within one of the quintessential ballparks, graphic signifiers improved the club aesthetic and helped communicate a more sophisticated experience. Designs for a Levy Restaurant renovation included new environmental graphics and menu boards that worked with the All-American baseball card concept, presenting winning ways to combine signature cuisine with flexible and clear communication of seasonal and daily menu options. The cards could be adapted seasonally and worked well with newly installed monitors, adding them into every fan’s conversation. As a special event strategy, the concept could easily change, install and re-install.